Former UK Prime Minister Tony Blair is godfather to one of Rupert Murdoch's young children, it has emerged. Mr Blair was present last March when Mr Murdoch's two daughters by his third wife, Wendi Deng, were baptised. The revelation comes in an interview with Ms Deng in a forthcoming issue of fashion magazine Vogue. 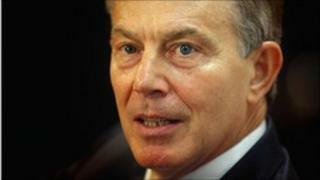 Tony Blair's office declined to comment on the report, which sheds new light on Mr Blair's ties with the media mogul. Mr Blair, who is said to have been "robed in white" during the ceremony, is the godfather to Grace, the second youngest of Mr Murdoch's six children. The nine-year-old was baptised with her younger sister Chloe, on the banks of the river Jordan, at the spot Jesus is said to have undergone the same ceremony, according to Vogue. Photographs of the event, which took place a few weeks before the UK general election, were featured in Hello magazine, but Mr Blair's involvement was not revealed at the time. Australian actors Nicole Kidman and Hugh Jackman were named as godparents to the two children but there was no mention of the former Labour leader, whose presence at the ceremony has only now been revealed by Ms Deng in a rare interview. In the Vogue article, Mr Blair is described as "one of Murdoch's closest friends". When he was Labour leader Mr Blair angered many in the party, including former leader Neil Kinnock, who had been vilified by Mr Murdoch's Sun newspaper ahead of the 1992 general election, with his decision to woo Mr Murdoch. The two struck up a friendship after he accepted an invitation to address a News Corporation conference on Hayman Island, Australia, in 1995, when Mr Blair was the leader of the opposition. In his autobiography A Journey, Mr Blair describes how he came to like and admire the media mogul, despite his right wing, Eurosceptic views. "He was hard no doubt. He was right wing. I did not share or like his attitudes on Europe, social policy or on issues like gay rights, but there were two points of connection: he was an outsider and he had balls," writes the former prime minister. Wendi Deng made headlines round the world in July when she dramatically jumped to the defence of her husband, who was attacked by a foam pie-wielding protester as he gave evidence on phone hacking to the Commons culture committee. In the Vogue interview, which took place before the select committee hearing, Ms Deng said the phone hacking scandal, was giving her sleepless nights. She says: "Of course, as Rupert's wife, I think it's unfair on him to be going through this. I worry about him being alone. "He has no PR people advising him. He tells me not to come but I'm flying to London for the hearing. I want to be with him." Mr Murdoch's son James, who gave evidence to the committee alongside his father, faces the prospect of being recalled by MPs, after a key part of his testimony was questioned by former News of the World editor Colin Myler and legal manager Tom Crone. Mr Myler and Mr Crone are due to be grilled on Tuesday by the culture committee on their version of events.